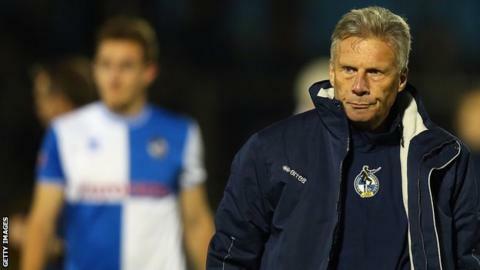 Bristol Rovers need to make significant changes if they are to return to the Football League, says director of football John Ward. Saturday's defeat by Mansfield saw Rovers relegated to the Conference for the first time in their history. "We've got to make major decisions pretty quickly to make sure we give ourselves a chance of rebounding," Ward told BBC Radio 5 live. "To come back at the first attempt is extremely difficult." He continued: "A lot of the teams there are ex-League clubs. It's a difficult task in front of us to regain our pride and our League position." Bristol Rovers, members of the Football League since 1920, went into the final game of the League Two season needing a draw against Mansfield. But their 1-0 defeat, coupled with wins for Northampton and Wycombe, saw the Pirates relegated on goal difference. After the final whistle, hundreds of fans stormed onto the pitch to vent their anger at Rovers' drop to non-league, and police horses were brought in to clear the crowds. "There were some very angry people and I understand that, but it looked pretty awful against our football club," said Ward of the pitch invasion. "It just shows you how badly people have taken it. "The dressing room was full of tears. There's a lot of sadness and unhappiness, as well as anger around the place." Ward was appointed manager for a second spell in December 2012. But after they dropped from 14th place into a relegation battle in March, it was decided Ward would take a director of football role, with his assistant Darrell Clarke stepping up to be first-team manager. Clarke secured two wins and a draw from their last eight games but it was not enough to keep them up. And Ward says it is now down to the board who takes the club forward in the Conference. "I'm trying to re-group the group. We need to get that staff leadership as strong as we can, under very difficult circumstances," added Ward. "We need to make the next moves as positive as we can, as we will be heading into a very tough season. "The chairman and the board will have to make the decisions on all of us. Not just Darrell - I imagine everyone at the club is concerned about their positions."